When you get some of the biggest names in European finance and politics together, you may not get agreement but you will get many answers as to how Europe might be tackling its many challenges. This debate about Europe’s future couldn’t have come at a better time, with the refugee crisis, along with Italy’s new government’s hard-line stance against immigration and the EU, Brexit and political uncertainty in Germany. So step forth Jan Peter Balkenende and Jeroen Dijsselbloem, respectively the former Dutch prime minister and finance minister, the pro-Brexit former Bank of England governor Lord Mervyn King and Klaas Knot, the President of the Dutch Central Bank. Along with politicians, commentators and journalists, Lorenzo Bini Smaghi, Société Générale's Chairman was heard alongside the ECB’s Peter Praet. ING’s Roland Boekhout, who sits on the bank’s Management Board and ING’s Chief Economist Mark Cliffe debated the issues with the likes of MEP Marietje Schaake in sessions broadcast from Frankfurt, London, Amsterdam and Paris. ING co-sponsored the event. We need to deepen efforts to complete the banking union, an essential pillar for a well-functioning monetary union: that was the key message from Peter Praet, Executive Board Member of the European Central Bank. He kicked off the conference in a pre-recorded message from Frankfurt. In the Amsterdam sessions, panellists echoed Praet advocating a more diversified financial landscape with deeper and more complete markets. There was much agreement that the Banking Union is a crucial step towards a fully-fledged Capital Markets Union. But while some believe we could have a complete banking union within a few years, others suggested we’ll still be waiting in a decade. A big sticking point is the European Deposit Insurance Scheme. It could ensure higher liquidity across member states and strengthen stability, although some questioned whether the Eurozone, especially some southern states, still needed more meaningful structural reform before it could be enacted. The conference then moved towards those structural reforms and the Eurozone crisis. Jeroen Dijsselbloem acknowledged the challenges ahead but also the good progress that has been made. He urged the need to make further improvements in the Dutch housing market and the country's pension system, clearly indicating this isn’t just a North-South problem. But Italy dominated early discussions and Dijsselbloem was clear that we need to see more progress as far as Italy is concerned. Not surprisingly, he sees a bright future for Europe and the Eurozone, although others were more sceptical. Daniel Mügge, Professor of Political Arithmetic at the University of Amsterdam, emphasised this issue in the context of European rules. The fear is, he suggested, that we spend too much time designing the ‘perfect’ system rather than dealing with real-world issues. ING Chief Economist, Mark Cliffe, stressed the importance of the ‘fiscal side of the equation’ as opposed to structural reforms and the ‘supply side’. He mentioned the mass unemployment in Italy with particular concerns in connection with the recent rise of populism. “It is clear that a lot more work needs to be done on structural reforms and the supply side which might improve the potential growth of the Italian economy in the long run. But the Italians didn’t vote on the potential, they voted on the reality, which is mass unemployment” Mark said. Another key issue with structural reforms is speed and execution. “Is this going to happen quickly enough for it to make a meaningful difference to Italy? I am rather worried about that. Therefore, I think we need to enhance the shock absorbing capacity of the fiscal structure in the Eurozone”, Mark added while emphasising the importance of enhancing the countercyclical fiscal capacity. 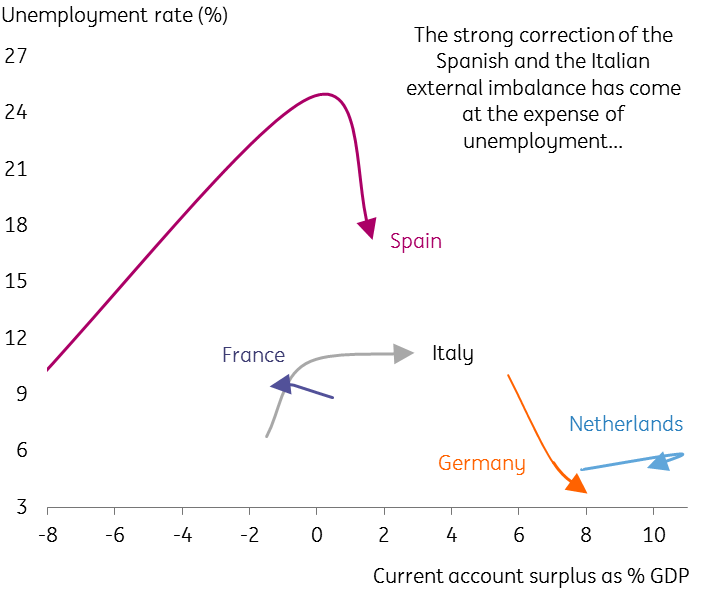 The debate then moved towards the fundamental asymmetry of the Eurozone, where large external and domestic imbalances continue to dampen a gradual and balanced convergence in income levels. As Martin Wolf candidly noted recently in the FT, the Eurozone adjustment mechanism reminds him of the 19th-century Gold Standard, where “prolonged recessions are a feature, not a bug”. Mervyn King, the former Bank of England governor, echoed Martin in a subsequent discussion. While the other panellists probably wouldn’t share King's scepticism, they all seemed to agree that the current state of the monetary union is far from perfect and hard choices and compromises lie ahead. Klaas Knot, Governor of the Dutch central bank, highlighted how rising wages and labour income shares in core countries might be the appropriate response to address the issue of large current account surpluses, a view largely shared by the other panellists. He acknowledged that despite the recent cyclical upswing, the Eurozone is not shockproof and more work needs to be done on real convergence. Crucially, large and persistent current account surpluses are not sustainable in the long run, it was argued. Further to Klaas’ comments, Mark Cliffe accentuated the trade-off between domestic and external imbalances. The big correction in current account deficits following the Eurozone Debt Crisis happened at the expense of higher unemployment, especially in the periphery and not least in Italy, he noted. Solidarity could be one of the key drivers that may help to restore confidence and trust to Europeans. “We need new ways to rebuild the trust that has clearly been undermined in the last couple of years”, said Mark. And while a lot of progress has been made, the last time that we lulled into complacency it didn’t end very well. Europe is at a crossroads, he said, and with the global economy on the brink of a trade war and national populists on the rise, it’s time to give some answers to the European people and the European project. The whole conference covered many themes and topics with the associated differences of opinion you’d expect. But there was general agreement on one key aspect of the debate, and that is that Europe and its leaders must not be complacent; no one knows where the next big crisis will come from. Europe’s leaders need to finish what they started and strengthen their institutions, but they forget the people of Europe at their peril. With populist movements growing in many areas of the continent, it’s a lesson they need to heed and heed quickly.